DJH Construction Inc » News » DJH Construction Gets Involved! News on August 22nd, 2012 Comments Off on DJH Construction Gets Involved! On May 19th, 2012 DJH Construction made a substantial donation to a non-profit solar installation organization, GRID Alternatives. Each division of GRID Alternatives has an annual “Solarthon,” which is a massive solar installation/block party/fundraiser. 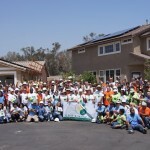 The Inland Empire division for GRID Alternatives was hosting its first “Solarthon” and was seeking support from businesses in Southern California. DJH Construction understood that the event would have a tremendous impact on the community and made a considerable donation of equipment, money, tools, and man power for the event. Students from the University of Redlands USGBC chapter were touched by DJH Construction’s President, Don Harris’ willingness to guide and teach them through the installation process.